Two men were arrested after the fracas. POLICE IN THE North attended a scene in an Antrim town in the early hours this morning where fighting had broken out among a large crowd. 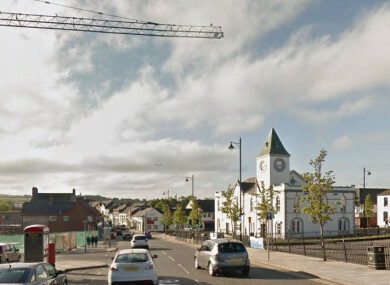 Officers were called to the scene on the main street in Ballyclare just after 3am, and found around 50 people had gathered there and a fight had broken out amongst them. When police arrested a 23-year-old man on suspicion of a number of offences including being in charge of a vehicle while unfit through drink or drugs, assaulting police and criminal damage, the PSNI said the crowd “became hostile towards police”. Inspector Alison Ferguson said: “CS spray was then used to restrain a 36-year-old who was subsequently arrested on suspicion of disorderly behaviour. He was released, pending report. Ferguson added that a number of police officers received minor injuries in the incident, and appealed for witnesses to come forward. Email “Officers injured in mass brawl involving 50 people on main street of Antrim town”. Feedback on “Officers injured in mass brawl involving 50 people on main street of Antrim town”.